Shopping for hardware and home improvement products can be confusing. 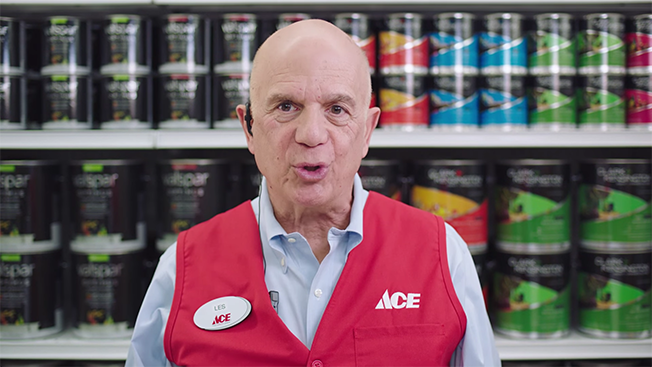 So Ace Hardware is putting a humorous spin on the process in ads with long-winded addendums to its traditional jingle, "Ace is the place with the helpful hardware folks." The new ads, by O'Keefe Reinhard & Paul, start with the classic jingle and feature Ace associates answering customers' questions. In one spot, a customer enters a store asking for "the stuff for squeaking hinges. I think it's called 10w40." The Ace associate steers him in the right direction as the jingle plays, "Ace is the place with the stuff for squeaking hinges that's called WD40, not 10w40, which is motor oil that we also sell." In another spot, an Ace store owner offers a customer paint samples to test on her walls at home. The jingle: "Ace is the place for a taste before you buy the whole meal. That's a metaphor. Don't eat paint." The campaign includes 25 TV spots filmed at three Ace stores in Houston, Orlando, Fla., and Chicago, using a cast of 25 Ace employees and 40 real customers. "The recall is really high on our jingle, so we decided not to re-create the wheel. We wanted to start with what our customers were most familiar with and show real problems that our customers come in with," John Surane, evp of merchandising, marketing and sales at Ace, told Adweek. "When you hear the new jingle, you still think about the old jingle, even though we're having fun and singing new lyrics," Tom O'Keefe, CEO of OR&P, said. "We wanted to celebrate the well-loved jingle and find a new way to bring it to life in a way that felt true to the essence of Ace and Ace's helpfulness."